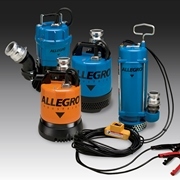 Allegro Industries offers a complete line of work equipment for use in confined spaces. Included in the line are AC Dewatering and Sludge Pumps, work tents, a tent heater, umbrellas, guard rail, guard rail winch, manhole signs, shields, and lid lifters. All the equipment is designed for convenience and durability. Four models of Dewatering and Sludge Pumps offer continuous operation at low water levels and extended dry runs without overheating the motor. These portable, submergible pumps are excellent for manholes, vaults, construction sites, and all dewatering needs. The DC Submersible Dewatering Pump is a totally enclosed, submersible dewatering unit. Watertight o-ring seals keep pump’s internal parts completely dry and it delivers up to 43 gallons per minute (gpm) for rapid dewatering and instant prime. It can operate on any 12 volt truck or automobile battery, and the low 30 AMP draw allows for an hour of operation without starting the engine. Additional pump models and hoses feature fire-hose-style quick-connect fittings, and a V-ring to protect the shaft seal from abrasives. A Standard model offers easy disassembly with one 12mm box/socket wrench. The Low Water Pump is perfect for civil engineering sites or utility pits where all water must be drained. It pumps down to 3/16” The Sludge Pump is excellent for standing water containing sand, solids leaves or debris at a max of 50 gallons per minute. The pump discharge hose features a tough PVC material and collapsible design to allowing for compact storage. The Pump Discharge Hose features tough PVC material, collapsible design for compact storage and fire-hose quick-connect design 50’ x 2”.